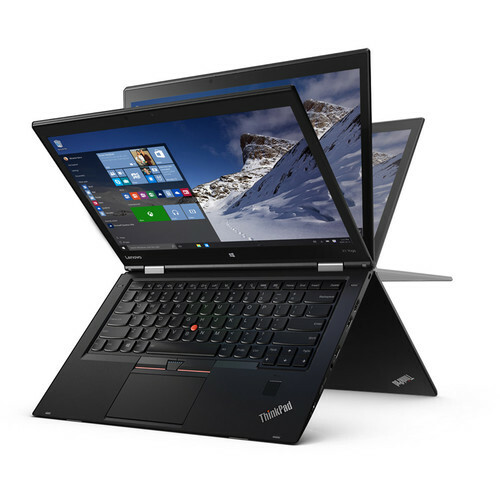 The ThinkPad X1 Yoga Multi-Touch 2-in-1 Laptop from Lenovo is a system whose screen can rotate up to 360° to vary between laptop, tent, stand, and tablet modes. That means you can select a specific mode based on what you need to do and combine it with the keyboard, TouchPad Pen Pro, and/or the 10-point multi-touch screen to help maximize your productivity. Its 14" display features a 2560 x 1440 resolution and is built with an IPS panel for crisp and clear pictures with vivid colors. Specs-wise, it's powered by a 6th-generation Skylake Intel Core i7-6600U processor that sports two cores, which have frequencies between 2.6 and 3.4 GHz, 16GB of 1866 MHz LPDDR3 RAM, integrated Intel HD graphics, and a 512GB M.2 NVMe PCIe SSD. Should you need more storage space, you can attach external storage solutions using its multiple USB ports. Other integrated features include a TouchPad Pen Pro, mini-DisplayPort and HDMI outputs, 802.11ac Wi-Fi, Bluetooth 4.1, a webcam with microphones, speakers, a fingerprint reader, a microSD card reader, a backlit keyboard, and an audio in/out combo jack. The operating system installed is Windows 10 Pro. Easily change between four modes – laptop, stand, tablet, and tent – based on what you want to do, and your system automatically switches system settings to match. When your Yoga switches between modes, the keyboard frame automatically rises and the keys lock, eliminating accidental keystrokes and providing a more comfortable grip. You can rest assured knowing your data and hardware are safe, thanks to features such as TPM encryption, a fingerprint reader, and a Kensington lock slot. Box Dimensions (LxWxH) 18.8 x 12.0 x 3.4"